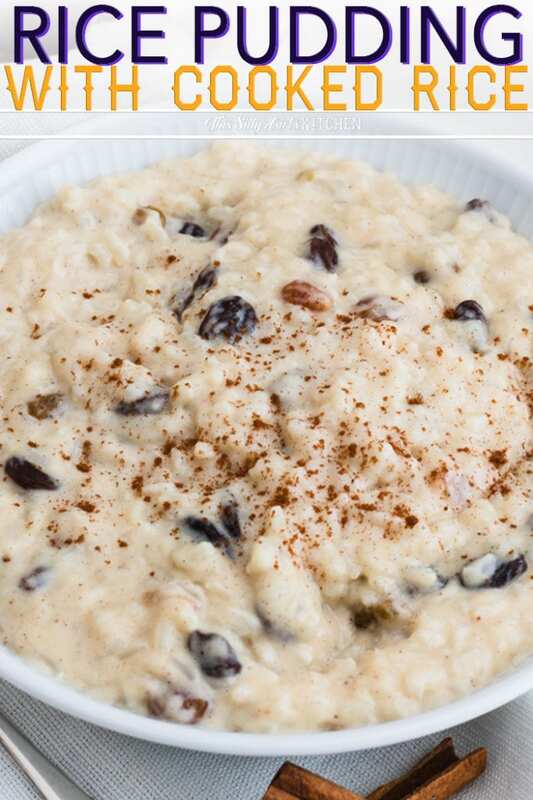 The unique part of this Rice pudding with Cooked Rice recipe is that I use two different colored raisins to perfect this delicious homemade rice pudding. 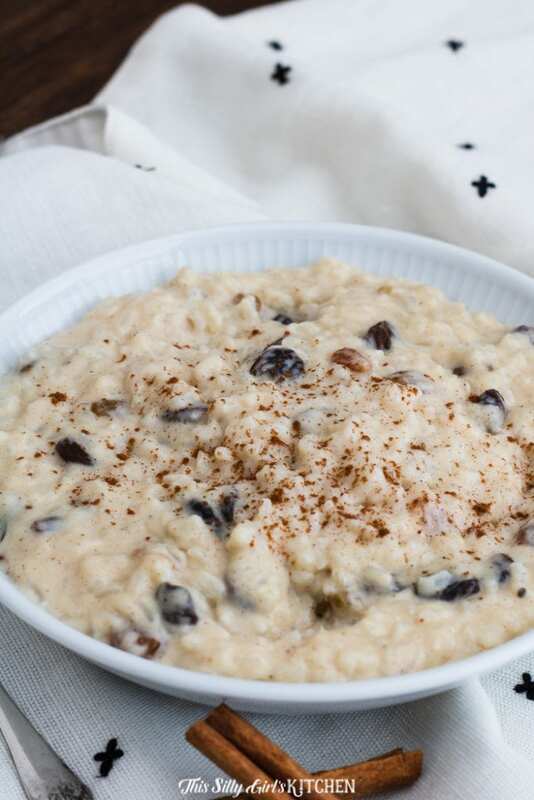 Using rice that has already been cooked is a great way to use up leftovers for this Rice pudding with Cooked Rice! You will be surprised at how easy this recipe is to make as well as the colorful appearance when you use golden raisins with regular raisins. 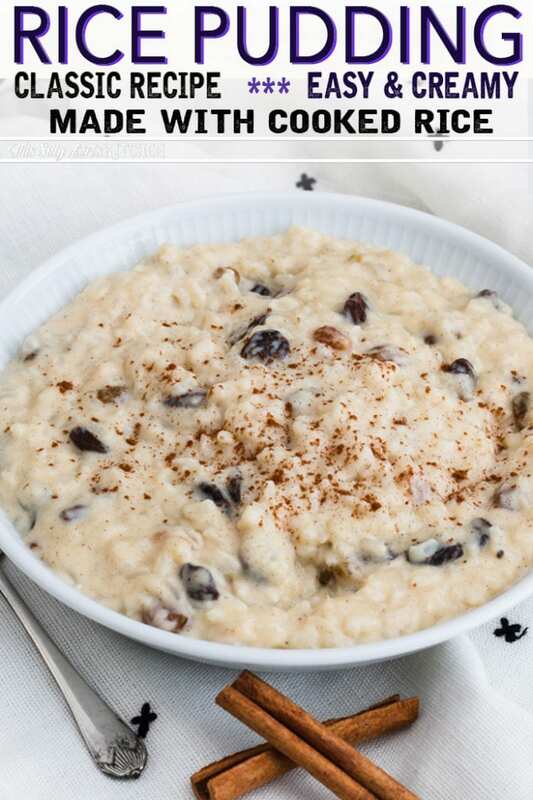 Serve this Rice pudding with Cooked Rice warm or cold! 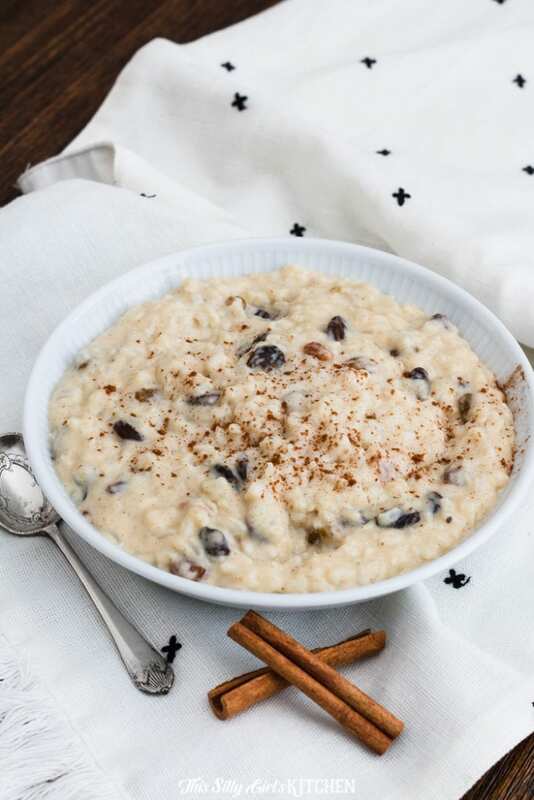 This recipe will make 4 servings, so if you’re whipping this up for some guests you may want to double or triple up the recipe to make sure everyone can get a taste of this rice pudding. Take me to the rice pudding with cooked rice recipe already! 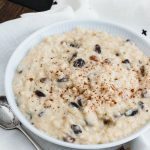 If you would rather not hear my super helpful tips and tricks, FAQ, and my overall awesomeness and get straight to this unique rice pudding with cooked rice – you can very easily scroll all the way to the bottom of this post for the full printable FREE recipe! Bon appetit. There are many ways you can make rice pudding with cooked rice. It’s all about what type of flavor or uniqueness you’re looking for. For my recipe, you’ll take the cooked rice, milk and salt in a small saucepot and let cook for about 10 minutes. Other people have also used a microwave to make rice pudding with cooked rice. While I don’t generally enjoy using a microwave to make rice pudding, it is possible. If you want to use the microwave you’ll simply place the milk, eggs, sugar, and salt into a 2-quart microwaveable bowl. 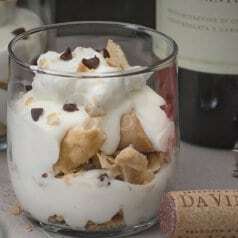 Stir in your heavy cream, cooked rice, raisins, golden raisins, nutmeg, cinnamon, and vanilla. Cook this on high for 8-10 minutes, stirring every 1-2 minutes. Put cooked rice, milk, and salt in a small saucepot over medium-low heat stirring occasionally for about 10 minutes. Put the beaten egg, heavy cream, cinnamon and nutmeg into a small separate bowl. Pour your sugar into the rice mixture and stir it up to combine. Stream the heavy cream mixture into the saucepan, stirring occasionally until combined. Stir in your golden and regular raisins. You’ll then stir this mixture occasionally for approximately 5-8 minutes. Once your Rice pudding with cooked rice has thickened, you may remove from heat and stir in the butter and vanilla. Allow this rice pudding recipe to cool for about 10 minutes before serving. 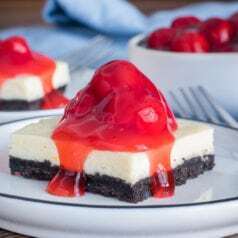 This is a delicious dessert idea that will complement any meal! Can I Make Rice Pudding with Cooked Rice? Yes! You can most certainly make rice pudding with cooked rice. All you have to do is cook the rice beforehand, according to the package instructions and then follow my step by step instructions on the free printable recipe card below. Making rice pudding with cooked rice helps saves you time in the process of making rice pudding to serve as a dessert to your family or guests. If you make rice pudding using all natural ingredient options, then yes this could be a healthier for you option. Rice pudding does offer fewer calories than other dairy dessert options and it has about 4 grams of protein per ½ cup on average. Rice pudding with cooked rice is lower in cholesterol than other dairy desserts and has a good amount of calcium for your daily diet intake. 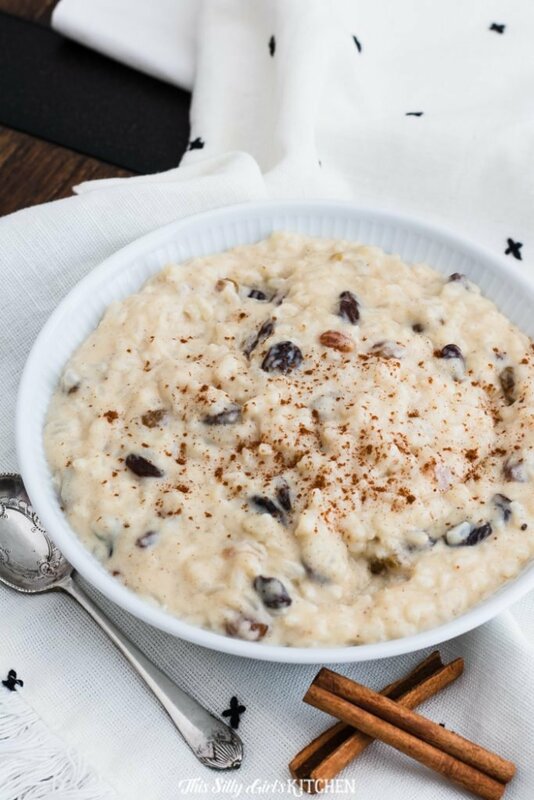 Ideally, you’ll make this rice pudding with cooked rice and serve it immediately as it’s not really a cook and serve later type of dish. How to reheat rice pudding? 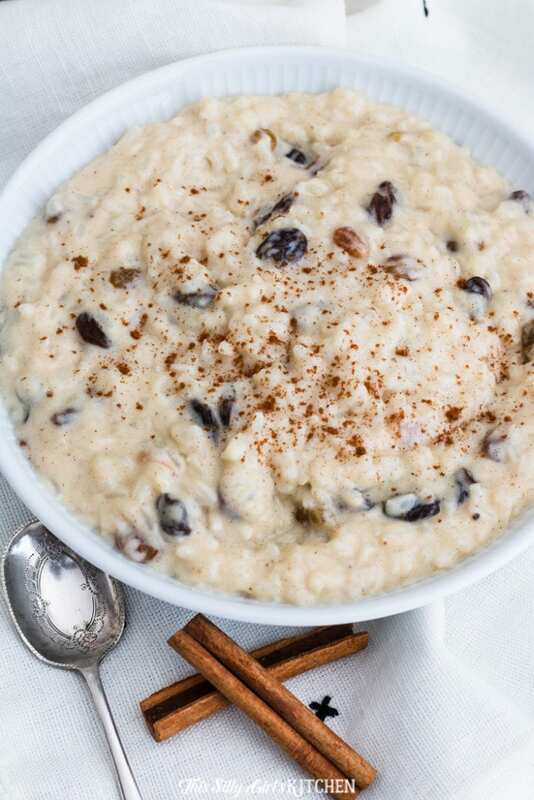 If you must reheat rice pudding then you can store this recipe in an airtight container for up to one day in the refrigerator and reheat in the microwave or saucepan on the stovetop until heated all the way through. Place the cooked rice along with the milk, and salt in a small saucepot over medium-low heat. Stir occasionally until thickened, about 10 minutes. In a small bowl, whisk together the beaten egg, heavy cream, cinnamon, and nutmeg, set aside. Pour the sugar into the rice mixture and stir to combine. 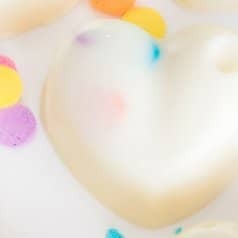 Stream in the heavy cream mixture, stirring constantly until combined. Add both varieties of raisins, and stir to combine. Continue to stir occasionally until thickened, about 5-8 minutes. When it is thickened, take the pot off the heat and stir in the butter and vanilla. Let cool for about 10 minutes, stirring occasionally, serve. I used oatmilk in this recipe. It turned out very yummy! Can you use brown rice to make this as well?